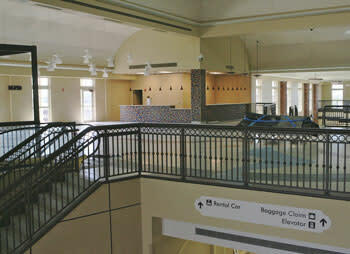 The Lake Charles Regional Airport recently opened its new $28 million Lake Charles Regional Airport Terminal. The new 45,000 square foot terminal building offers passenger conveniences like second floor passenger loading, a gift shop, a café and state-of-the-art baggage claim facilities. These new features plus many more will mean safer and more efficient movement of travelers into and out of the area. The building was designed in the Louisiana Colonial style with columns and balconies and the selected finishes in the interior of the building lend a warm and timeless character to the building. The colors used in the concession area are reminiscent of Mardi Gras. Another change brought on in the summer of 2009 was the return of American Eagle to the area. In mid-June American Airlines began servicing the area with two flights into and out of Dallas/Fort Worth. The American Eagle service is now being offered in addition to the already existing Continental Express service to Houston. With both airlines on board, travelers now can make their way to Southwest Louisiana from literally anywhere in the world. The excitement of having a choice of airlines is not lost on tourism. Service from Houston and now Dallas allows the sales team at the bureau to market to a larger, more diverse audience, attracting new business and leisure travelers to the area. For more information on the Lake Charles Regional Airport, log onto www.flylakecharles.com.